Welcome, Dear Readers, to Spill the Beans Friday where I confess personal things about myself that you may have suspected but you were much too polite to mention. #1) I can’t type, I can’t proofread and if my life depended on spelling, I’d be dead by noone nune 2 p.m.
#2) I sugar coat my sweets addiction. #3) I don’t just hate algebra, I want it whacked. #4) My frontal lobes are abnormally small. #5) Practically everyday I think it’s the day before the day it actually is. #6) Both input and imput sound right to me. #7) I am horrible at video games. It once took me 40 minutes to successfully complete one lap in Mario Kart and why do they need so much grass anyway? #8) I always hang back when it comes to being the bowling scorekeeper or the flag folder as I have no idea how to do either. #9) I’ve never tried green enchilada sauce and I’m never going to unless it’s fed to me through a tube while I’m in a coma. #10) I’ve never been in a coma. #12) I’m super excited about the first two pictures I see in an Art Museum then I’m over it. #13) I only spelled museum right in #12 because of spelcheck spellcehck, right click. #14) If someone tells me a really long story they’ve told me before, I can never think of a polite way to say, “Yeah you already told me that” so I just listen to the whole story again. #15) I think my horse knows more than he’s letting on. #16) I’m a total idiot about Bulgaria. #17) I love I Love Lucy. #18) I’m a food kick person — if I make chili or soup, I eat it for every meal everyday until it’s gone. #20) I’ve been kissed by Bill Murray. #21) One time someone cut in front of me in line at the grocery store so I picked up a magazine and pretended to be reading it and pushed my cart into the back of them. #22) I once got a flat tire while taking my daughter to school and had to walk 6 blocks home in my stocking feet. #23) I think Portlandia is equal parts hilarious and unhilarious. #24) The only newspaper I read everyday is the wonderfully skanky Daily Mail Online. #25) I had to watched The Talented Mr. Ripley four times before I understood what was going on. #26) I once stood right behind a guy in line with tattoos all over his body while waiting to rent The Illustrated Man. And there you have it, Dear Readers! 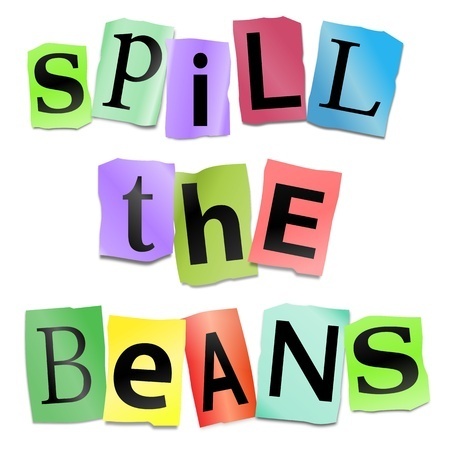 Drop by next week for another installment of Spill the Beans Friday! And if you have anything you’d like to spill the beans about, I’m all comment boxes!